Help Carla help animals in need! 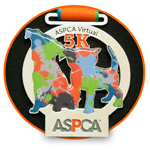 This June, I will be participating in the inaugural ASPCA Virtual 5K along with my dog, Coco! I am excited to participate and honored to raise awareness and the much needed funding to support the ASPCA's programs. My husband and I adopted Coco from a local shelter, and though we rescured her, there were and continue to be so many more animals that need food, medical services, and shelter. Though I can't save all animals from abuse, neglect and homelessness, I am proud to support the ASPCA by participating in this virtual 5K to hopefully make some degree of difference for animals in need. Your donation will help provide life-saving programs and services to millions of animals nationwide. I would so appreciate your help to give abused and homeless animals a second chance at life! Please support me by making a donation and help me continue to make a positive impact in the lives of animals! Thank you! Register today to receive your own finisher’s medal, race bib, and fundraising page. Get creative and stay active while you make a difference for animals.